Paul Cook’s plea to Wigan Athletic fans: Stick with us! 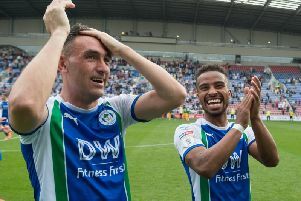 Paul Cook has asked the Wigan Athletic supporters to stick with his battered bunch as injuries and suspensions continue to bite. Latics are doing it tough at the minute, with Chey Dunkley the latest man to undergo surgery this week to cure a knee problem. The big centre-back will be out for ‘a period of time’, possibly until Christmas, while star man Nick Powell is currently battling tendinitis. With Will Grigg, Michael Jacobs, Gavin Massey and Gary Roberts already out with hamstring injuries, Cook has the small matter of a tough trip to Middlesbrough to contend with this weekend – with skipper Sam Morsy missing through suspension. “I would ask supporters at the minute...we are without quite a few players through injury,” the Latics boss said. “And we need support now from the stands more than ever. Some of the conversations I hear about football these days are mind-blowing – on the radio and around the game. “And I really don’t think football’s going to a good place in all this. “It was only 17 games ago we were winning the league at Doncaster in front of 4,000 away fans, having the party in the park, and we’re the happiest club in the world. “We’ve probably had the worst run we’ve had since I took charge, in the midst of a really bad injury problem. Latics have lost three in a row, but Cook chooses to look at the bigger picture. “Don’t forget we went nine games last season without conceding a goal,” he added. “This season, we’re in a very unforgiving league. “Around that, what a lot of managers will do – and a lot of supporters can do – is start to turn on people and players. “That’s a growing feature in football these days, and I think it’s one of the saddest parts of the game. “Sometimes you just lose games because you might not be quite good enough on the day.